The present scenario is that of countless candidates and very few job openings. The job scenario is extremely competitive and getting a job becomes a truly tough task. That is why today candidates are mentally prepared to work in different provinces and adjust to new lifestyles just so that they get hired into a good company. Very often candidates apply to far off companies and have the first round through phone job interviews. The phone job interviews can be very different from an actual face to face interview. If you are aware of the difference and prepare for the phone job interview round, you have more chances of getting the job you desire. There are some vital things you need to know about phone job interviews. We have mentioned these vital aspects below. You must remember that in a phone interview, the interviewer cannot see you. There are advantages and disadvantages of not being seen during the interview. Your voice is what creates the greatest impact during the interview so make sure you have complete control over your voice. If your voice is your asset, phone job interview is the place to use this asset. Candidates who have great control on their voice are able to alter their tone and convey the true meaning of their emotion. In face to face interview, the interviewers may be affected by your looks or your dressing but as these things are not visible in a phone interview, you can make the best use of your voice to create a lasting impression. A good choice of words is vital when you answer questions in phone interviews. As the interviewer is not able to see you, his entire concentration will be focussed on the words you speak. If you use the right words, you will be able to impress the interviewers easily. Avoid the words that are used colloquially and do not make sense in the formal environment. Strictly follow the formal code of conversation. If the phone interview can be scheduled beforehand as per your convenience, make arrangements for the same. There are many risks in phone interviews that can be avoided if you schedule the interview. If the interview is not scheduled, you may receive the job interview call when you are in a noisy place and you may not be able to concentrate. On the contrary, if you schedule the interview, you can make sure you are in a silent place when you receive the call. You can also check your device and ensure that it is functioning properly. Your manners and your ways define you during a phone interview. As the interviewer cannot see you, the entire impression is based on the way you deal with people. As the interview commences, make it a point to greet the interviewer. It can give the impression of proper upbringing and nice manners. When the interviewer is asking questions, hear him out, take time to frame a proper answer and then reply. It is essential that you give a proper thought to the question before you arrive at the answer. You must also be careful not to interrupt the interviewer when he is asking questions. The problem with telephonic interviews is that you cannot see the face of the interviewer. You cannot read their face and understand what is going on in their mind. Therefore, it is better to be on the safer side by avoiding questions about salary. Some interviewers tend to be judgemental and they conclude too quickly that you have mercenary intent in asking the salary. It is thus safest to avoid questions regarding the salary and pay on telephone. It is always better to negotiate salary during a face to face interview. Be prepared for the questions that may be asked during a phone interview. If you are mentally prepared, you will be in a better position to tackle the questions asked and have greater chances of getting the job of your choice. Here we have listed out a few of the questions that may be asked during phone interviews. 1. Why do you wish to apply for this job? The interviewers wish to know whether you have applied for the job just because you came across an advertisement of vacancy for the position or whether you have other reasons to join the firm. When they ask this question, you can confidently reveal to them the different things you like about the firm. You can enumerate the different reasons that attract you to this new job. You may also tell them how the firm will benefit by hiring you for the particular position. If they are satisfied with your answers, you may be selected for the next round of interview which could be face to face. 2. Why are you planning to relocate for this job? Didn’t you find a good job in your vicinity? If you are planning to relocate just to get a good job, interviewers could get curious. There are very few people who are willing to alter their lifestyle or change their residence just for the sake of the job. Unless you have a very strong justification, the interviewers won’t be able to digest this change. If they ask you whether you didn’t find another job in the vicinity, tell the interviewers frankly that you have always wanted to be a part of their firm and organization. You can tell them how they have an unmatched reputation that none of the companies in the vicinity can beat. Include facts about the company to support the answer and the interviewers are sure to be impressed. If you have not mentioned your qualification and certifications already, the interviewers may ask you the same during the interview. They may even ask further details like marks and percentages. It is thus better that you keep all the certificates close to you when you attend the telephonic interview. This will help you answer such question promptly without any delays. You may also mention about your studies and qualification when you introduce yourself. These facts also need to be included in the resume that you send to different firms while applying for jobs. 4. What are your skills and hobbies? The question actually attempts at unravelling the hobbies and skills that may prove helpful in the field you have chosen. Speak of hobbies and interests that help you perform better in the job you have selected. Avoid speaking of hobbies that do not matter at all in the present job. If you are applying for a writing job, mention your language skills or your special inclination and flair for writing. If you are applying for the job of an accountant, tell the interviewers how good you are with numbers. Avoid speaking of dance and music as hobbies if you are applying for core careers. 5. Are you a good leader? Firms look for candidates who can lead a team to complete projects as per the specifications and requirements. If you possess leadership skills, you need to mention it with sufficient examples to support what you say. You can mention about the different events you have organized in schools and colleges. You may also mention certain freelance projects that you have lead a team to complete successfully. 6. Are you a great team player? If you have to work in an organization or a firm, you need to be a team player. If you are not able to adjust with your colleagues and seniors, your days in the firm are numbered. Team players are good at understanding people. They are amiable, friendly and willing to adjust to the greater cause of a team. That is the simple reason why firms and organizations prefer team players to other candidates. Tell the interviewers how good you are as a team player. Tell them of the various occasions in school and college when you have worked with a team of friends to achieve vital goals. 7. Are you a good negotiator? Negotiation skills are important in most careers but they are truly vital in sales, marketing and managerial roles. The interviewers try to understand whether you possess these skills. They maybe asking this to know whether you will be able to tackle tough clients whom it is difficult to convince. Tell the interviewers about your special negotiating skills. Quote a few events from your life when your negotiation skills have saved the day. These points usually impress interviewers. 8. What do you think is your greatest strength? Speak of your greatest skill or ability that may prove helpful in the present career. You may also speak of your principles or ethics that help you stick to the right path even when the going gets really tough. 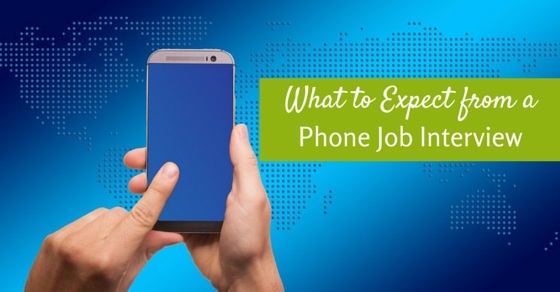 If you are properly prepared for a phone job interview, you can easily bag the job by creating the right impression.